'giffgaff' may not be a recognisable 'big brand' outside the UK but here it's known as a good value, pay-as-you-go, social cell phone network, plus your activity promoting/sharing giffgaff has direct financial benefits in terms of balance and rewards. And now the network has its own UWP, running on Windows 10 (PC and) Mobile. Check your balance, buy or recur new rolling monthly plans and browse our marvellous Community. All from the palm of your hand. Boom. Introducing the brand new Windows version of the My giffgaff app. Tah-dah. 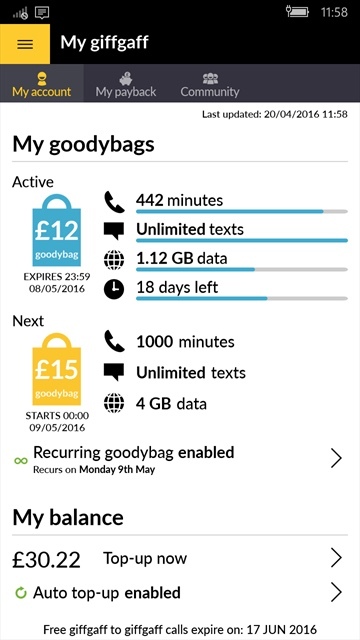 With this splendid app you can keep track of your giffgaff account, buy SIM-only plans on the go, set them to recur automatically and top up credit. All that nifty stuff and more. Now that deserves a high five. Check your usage and airtime balance. Buy, queue or recur a rolling monthly plan in seconds. Top up your airtime credit with a credit/debit card or top-up voucher. Top up another giffgaff number with a credit/debit card. Manage your auto top-up settings to never get caught short without credit. View your Payback points and order more SIMs. 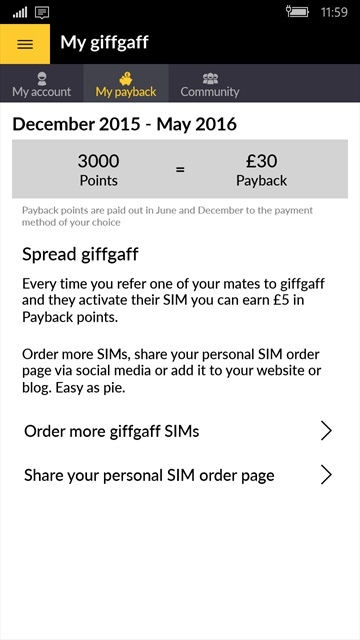 Spread the giffgaff love by sharing your personalised SIM order page. Access our fun and friendly Community, including a whole load of forums and blogs. 'My giffgaff' can be found in the Store here. I'll be trying it in the weeks ahead and will report back, no doubt. Comments welcome, but it looks comprehensive.